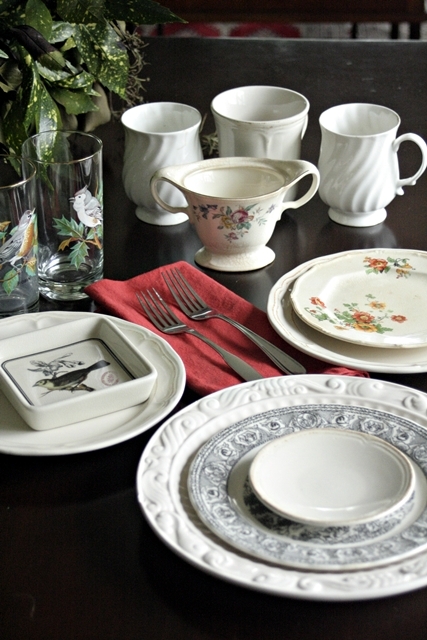 For years now, Ms.Jeannie has been collecting bits and pieces of antique china to use alongside her everyday dishes. These everyday dishes are as basic as basic can be: white, plain, unadorned. 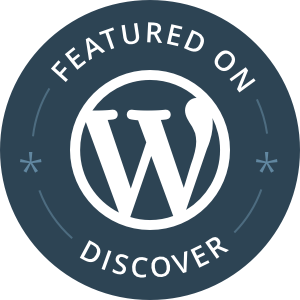 The only bit of flair they possess is that they were made by an Italian plateware company. This makes the plates oval shaped instead of round and the coffee cup saucers are offset to accomodate a slice of biscotti alongside your coffee cup. Other than that they are strictly ordinary. 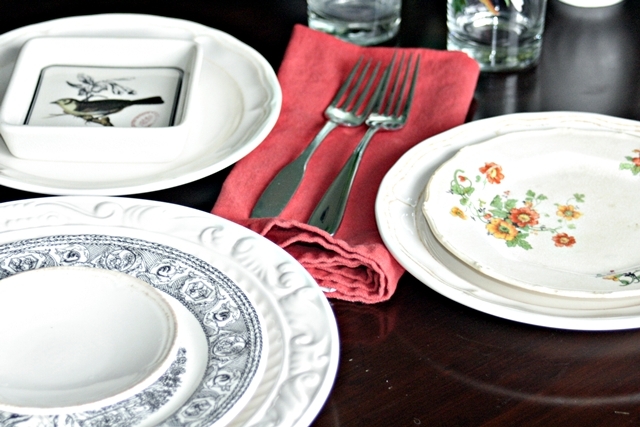 Having said that Ms. Jeannie discovered one day, while cleaning out her china cabinet, that when she paired these ordinary day plates with her vintage china treasures, her whole table setting instantly hummed with it’s own sort of individuality and surprise. The ordinary looked extraordinary and the mis-matched patterns looked marvelous next to each other because they contained a lot of similar colors. 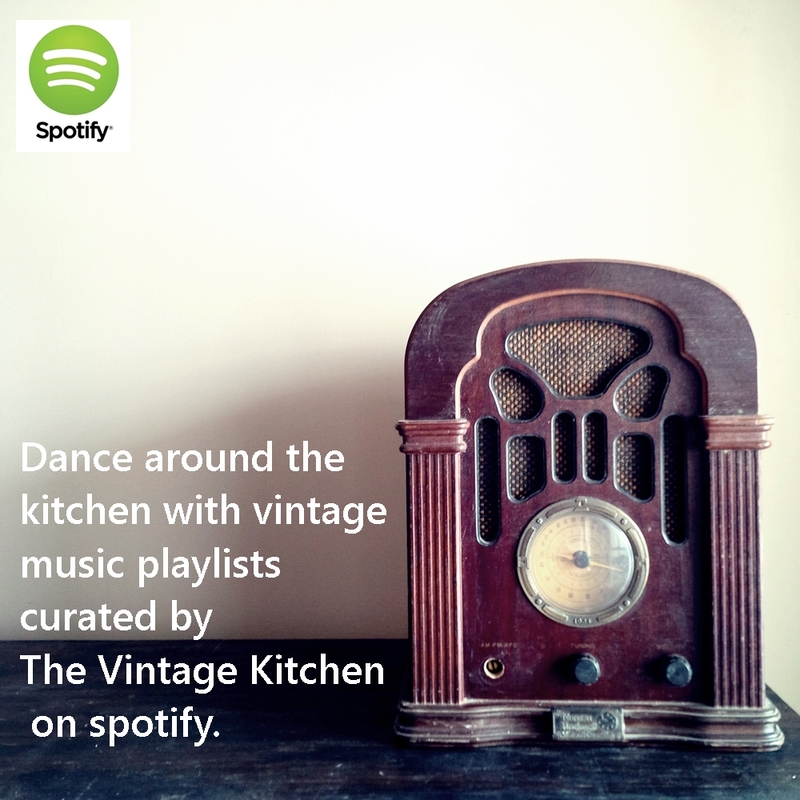 So Ms. Jeannie started experimenting and was delighted to discover a very broad range of different decorating options when it came to pairing vintage with contemporary. 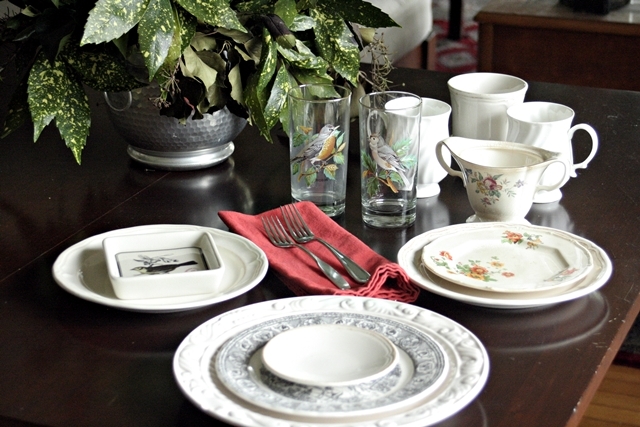 This is an example of how you can set a contemporary vintage table by combining contemporary dishes with vintage china. If you look closely there are 10 different plate patterns/designs in this setting. They all work together because they have two themes tying them together: birds and green leaves. The unexpected vermillion color in the napkin also helps tie together all the warm colors without looking forced or too matchy matchy. 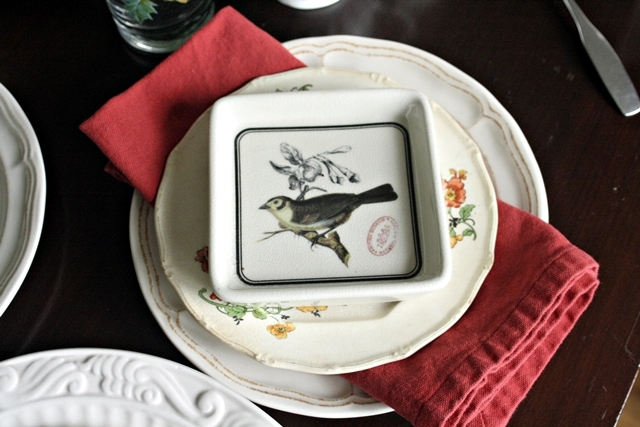 The square bird dish is actually a contempoary soap dish, but has been repurposed to act as a small bread plate or a drink coaster here. 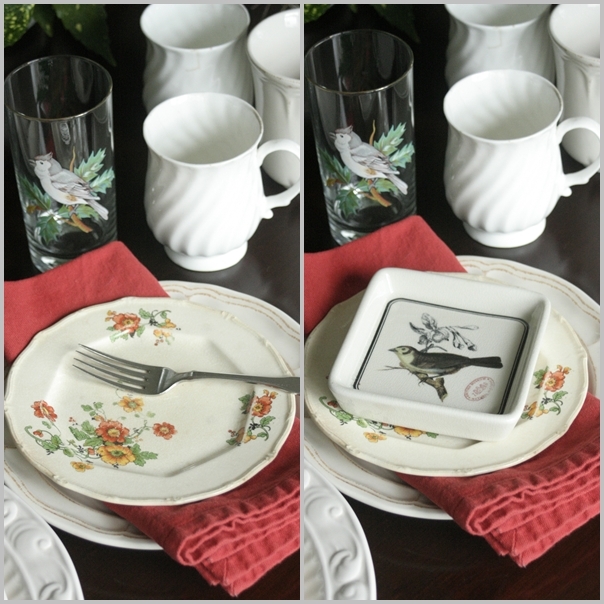 It also matches the colors of the black and white toile-looking hunt plate as well as the antique orange, black and green floral bread plate from the 1930’s. 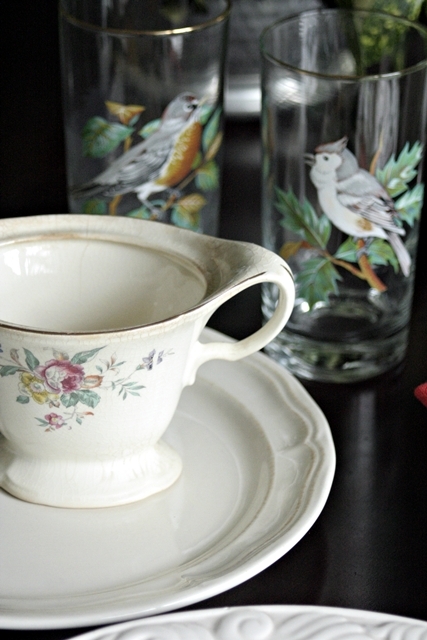 The colors in the antique sugar bowl match the colors found on the vintage bird water glasses. The crazing on the sugar bowl also matches the faux antique patina on the contemporary white salad plate from the Todd English Collection. 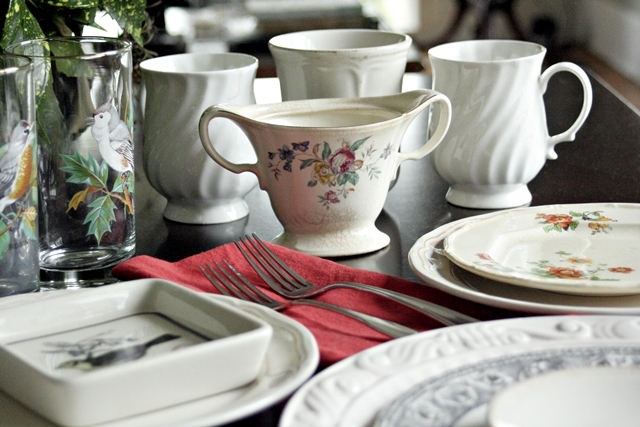 Ms. Jeannie is drawn to three things when it comes to scouting vintage china. She loves anything made out of old English ironstone, anything that contains the color green in its design and anything that contains crackling or crazing marks. So her collection has thousands of ways that it could displayed together since they have those three characteristics in common. 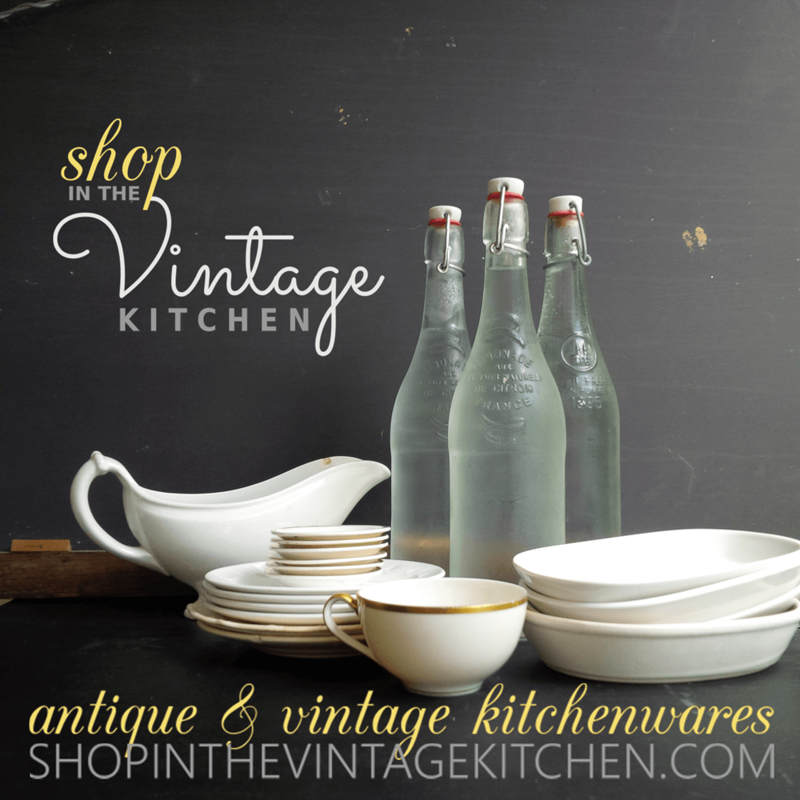 You can start your own vintage china collection based on color, shape, time period or region for your own unique look.